I noticed something happening on my Facebook the other day. Suddenly, I was getting a lot of “sponsored stories” (ie. ads) with salacious headlines. Things like “Stop eating chicken breasts immediately!” and “You won’t believe what this famous star has become.” Then I noticed them showing up on my news websites: “Enter your name, wait 12 seconds, and brace yourself.” (Really? Why 12 seconds? Isn’t 10 standard?) And once I started seeing them, suddenly they were everywhere. Welcome to 2017, the year that clickbait becomes the norm. There are several parts of that definition that jumped out at me. First, it’s all about the bottom line of selling stuff to unsuspecting internet browsers (like your students). Second, the people who create clickbait are very okay with sacrificing quality and accuracy. And third, they really want us to forward this garbage on to our unsuspecting friends and family and maybe help it go viral. 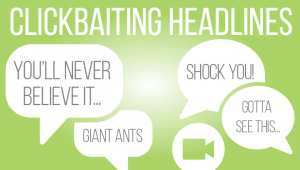 What makes clickbait so insidious is that, according to the latest research, American adults are fooled by their headlines 75 percent of the time and believe that the headline is true and factual. This is very scary and explains, to a large degree, the great divide we see in our country today. More than 80 percent of middle school students believed that an advertisement, clearly identified by the words “sponsored content,” was a real news story. Less than 20 percent of high school students used key details to notice that an unreliable source for a photograph was presented as evidence that nuclear radiation caused unusual growth. I think all of us can agree that clickbait is something that we wish didn’t exist. It’s annoying and distracting. Even I, who consider myself a well-informed individual, find it hard to pull my eyes away from some of their headlines. And that’s why they are so powerful. 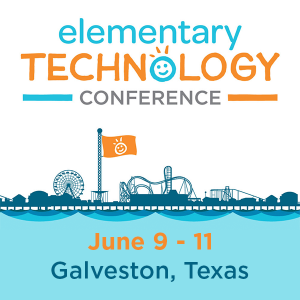 They are created to appeal to our sense of curiosity, which makes them a natural for children and teens to click on. 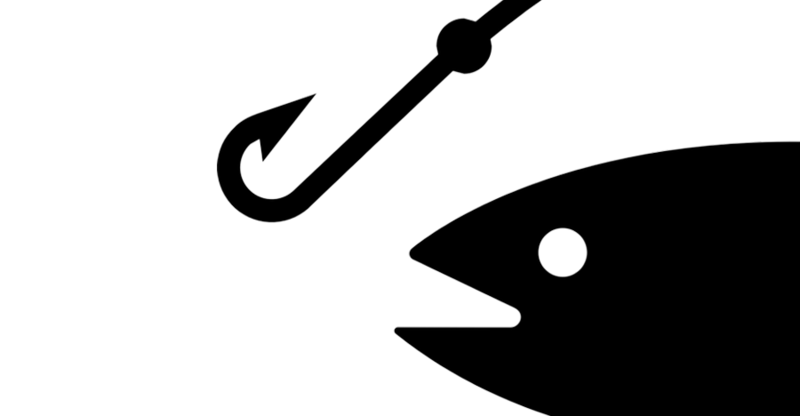 The other thing that makes clickbait so dangerous, especially to students, is that it appears the most on social media sites. Since today’s youth practically live on social media, this means that they must be taught how to avoid clickbait and the problems it can cause. And because clickbait works, its use will only continue to grow. Here are some tips that something you are thinking about reading is not worth your time. If you follow them, you will easily be able to recognize clickbait when you see it. The headline or title tells you nothing at all about the content of the article. For example “This Teacher Liked a Facebook Post; What Happened Next Is Awful.” Notice that the headline really doesn’t convey much about the story. What it does do is put a question into your brain: What happened to the teacher? They are counting on you wanting to know enough to click the link. Don’t! The headline is too good to be true. I think my favorite example in this category is “17 Cats Who Should Be Running for President.” Really? Cats for president? What’s the point of this article? If it’s too ridiculous to be true, it’s too ridiculous to be true and isn’t worth your time. The headline is in poor taste. Examples include “The Party Is Titanic!” and “10 Things Only People with Dysentery Will Understand.” Good journalists will not stoop to this type of headline. Enough said. The headline is too funny, too positive, too terrifying, too exploitative, or too anything else. Headlines should simply tell what the story will be about. It is not their job to engender strong emotions. They are supposed to be simply stating the facts. The headline follows a standard formula. Share the tips above with your students and have an honest discussion with them about the fallacies and dangers of clickbait. Then try some of the activities below to help them learn to recognize clickbait. Have them take a familiar story, like The Three Little Pigs, and create some obviously clickbait headlines for the story, the stranger the better! Have students use a headline generator, like the Link Bait Title Generator. Simply enter a topic, like “cats” and the generator will create numerous useless headlines. Discuss why it is so easy for a website to create so many headlines on one topic and what this says about the quality of the headlines being created. Discuss with them why clickbait can be bad. Have them create a PSA using video, audio, drawings, or writing to warn others. Take a historical event and write clickbait headlines for it. Then ask the students how these might color our view of the actual event if they were the only thing we knew. Assign a different topic that you have studied in the past to each student and have them create a clickbait headline for it. Then have other students try to guess what the topic is. With older students, have an honest discussion about what problems fake news stories, such as clickbait, can cause. Make sure to have examples handy. Have students play the Factitious online game. a way to test their news sense. Your high school students can try their hand at “spreading” fake news in this ten-minute online game from Cambridge social psychology professor Sander van der Linden. The goal of the game is to teach people how disinformation is made and spread. All of us can become better and more informed purveyors of the news stories being provided to us, but it will take a little work on our part. How will you help your students become better at this? This blog was updated with additional content on February 22, 2018. Congratulations 3D Design Contest Winners!